Welcome to the National Peanut Buying Points Association. 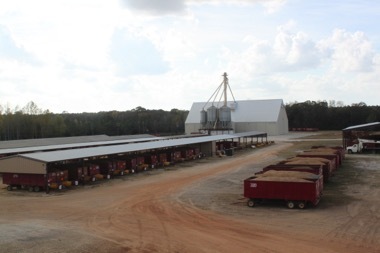 The Association seeks to represent America's 400+ peanut buying locations that contract, receive, weigh, clean, dry, inspect, grade and prepare peanuts for storage and later shelling. All U.S. produced peanuts must be inspected for quality by the Federal-State Inspection Service at a registered peanut buying point. The Association's goal is to be an informed liaison between the farmer and the peanut sheller, to strive for fair and transparent government rules and regulations, and to seek new and innovative technology that will foster the continuation of peanut buying points as a major segment of the industry. The Association will also conduct research and promotions that help to grow the peanut industry at home and abroad. Membership is important and active members, whether a buying point or allied industry supporter, may be restricted to MEMBERS ONLY. Communicating information on federal and state regulations and peanut markets around the world impact the profitability at each buying point. Membership dues are collected to help Association members have access to these facts and peanut industry developments. The Association welcomes your MEMBERSHIP.